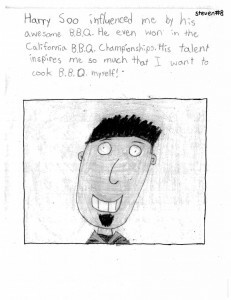 I was very touched when Steven, 10-year old son of a family friend, decided to write about me in his school assignment which was to describe someone who had inspired him. He drew a picture of me which his Mom said that he was too shy to share. Steven eventually give me that picture so I told him I’d show him how to cook our www.SlapYoDaddyBBQ.com award winning BBQ chicken. Here’s a short video our great time together. . .